Ahh, the patio. It's a great spot to relax and unwind when the weather is nice. But what about patio living once winter sets in? Patios are created for warm-weather living, but you don't have to give all that up just because it's cold outside. Put on your scarf and hat and consider these 3 ways to transform an ordinary patio into a space that you can enjoy all year long. Surprisingly, a fireplace isn't one of them! 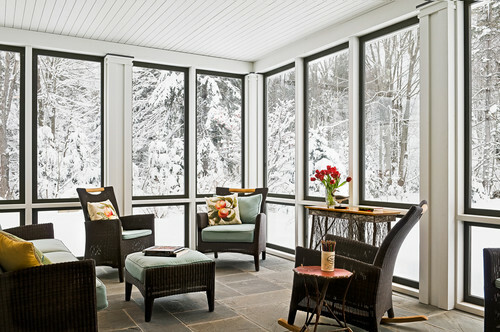 Four-season rooms differ from sunrooms or screened porches in that they are designed to be air-conditioned in summer and heated, at least somewhat, in winter. They're more like a room in your house, just with full walls of glass instead of smaller windows in standard walls. The cost isn't cheap. Better Homes and Gardens says the average stick-built, four-season room could set your back as much as $20,000. But if you're only claiming a portion of the open patio space for it, the costs might be a lot less. A less expensive option learned from one of my handyman customers in Exeter NH, is to swap storm windows for screens on your porch or patio. This homeowner also had us put down carpet padding and an outdoor carpet, to reduce the cold air underfoot and they enjoyed the outdoors unless it was bitter cold outside. Many patios have a roof overhead, and that's the beginning of what you need to change the space into something that's more winter friendly. Think about how old fashioned garage doors fold up instead of the roll-up style that most garages use nowadays. That's the idea behind hangar doors that you can raise or lower depending on the season. 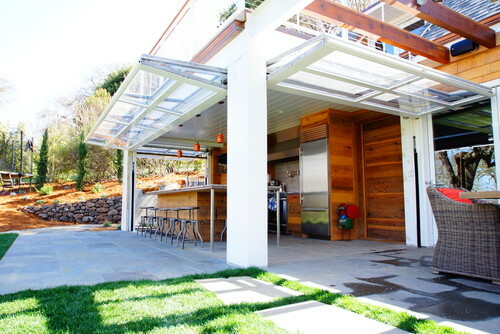 Hangar patio doors can have a little glass or a lot. You can use them to enclose an outdoor patio kitchen space or just the area where you like to sit and read a good book. The great thing about these doors is that they make the room fully adaptable to any season. When it gets warm outside, all you need to do is raise the doors and enjoy the nice weather again. If you're thinking about enclosing an existing patio, you might need to use several of these doors like the room above. The alternative is to add permanent walls to the sides of your patio room like this home in Las Vegas NV, which shows you what a hangar door feels like from the inside. Heat is absolutely a concern in winter months, as even in warmer climates it can get chilly at night. A fireplace or fire pit is a great addition to any patio, but it's not always feasible for a number of reasons. 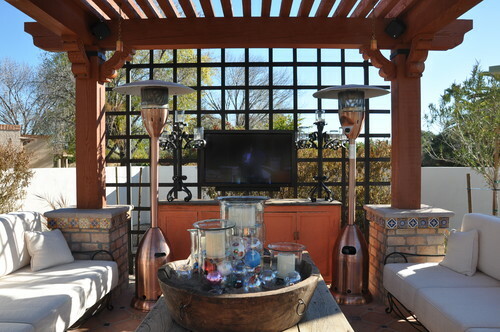 To add heat that makes the patio more comfortable, patio heaters might do the trick as many restaurants have proved. These heaters come in upright or tower-style models and smaller versions that can be mounted high on a patio wall or the ceiling in a covered patio. Wisconsin contractor, Ken DePratt, tells HGTV that in some areas, building code can be a real challenge if you add an open fire-burning space. Gas or liquified petroleum (LP), also known as propane, heaters come with less red tape to work through. Whatever you do with your patio, chances are you'll need a good contractor that you can trust. Whether you want to add a small four-season room to a corner of the patio or the fireplace you've always dreamed of, you'll want to know that the construction is up to code. We can help you with “Finding and Hiring Home Contractors,” so your only worries might be how soon you can use the space.